When you are asked to lend your Windows 10 computer to some else for several days, the most appropriate response may not be saying NO to avoid privacy issue, nor handing over your log in account directly. Instead, you can add a new user account to Windows 10 and give limited permissions to that account. In this article, you will know the difference between Administrator account and Standard account, how to add new user account on Windows 10 and manage Windows 10 user permissions and privilege. All over the years of using history of Windows, you might never realize that you have been using the computer as administrator user with privilege, but it is true. If without administrative privilege, a user will get restricted in some aspects on a Windows 10 computer. By privilege level, there are Administrator account and Standard account. The Guest account on previous Windows OS is removed from Windows 10. By role, there are Family account, which includes Adult and Child account, and Other people account. By sign in method, there are Microsoft online account and Local account. Don’t get confused. You will get step-by-step guide below after knowing the permissions of Windows user accounts. Even though there are several kinds of user account, the differences in permission are mainly based on Administrator/Standard accounts. Administrator vs. Standard: Administrator account has highest privilege, of course. Standard account can’t change security settings, install apps, or modify anything that could affect other users. Here is a fun fact: Administrator account users still need to choose “Run as administrator” for some apps and get UAC (User Account Control) alert to prevent malware from automatic installation. Standard account users will need password to perform the same activity. Adult vs. Child: The permission of Adult and Child accounts is still based on their property of Administrator or Standard. However, Adult account can set limit to Child accounts, such as screen time, content quality, and spending, and monitor their activity and location (require Microsoft Launcher installed on their mobile phones). 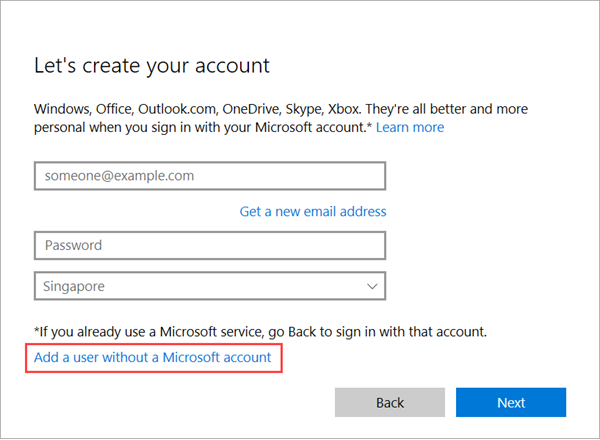 The restriction for Local account is that the owner can only sign in to one device with an assigned username and password. There is no way to recover a forgotten password for local accounts, except for on version 1803, which can set security questions. All newly added user accounts are Standard by default. Please jump to the last part of this tutorial for changing to Administrator account. Here we are going to show how to add Adult and Child to your “Family”. Step 1. Go to Start menu > Settings > Account > Family & other people. Step 2. Click Add a family member. Step 3. Choose Add an adult, then input an email address and click Next. It must be a registered Microsoft account. Step 4. Click Confirm > Close on the next two windows. Step 5. 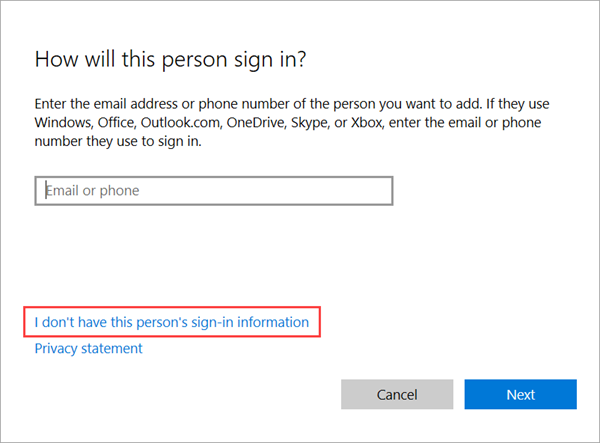 Sign in the Outlook mail of the added user to accept the invitation. The operation for adding Child account is almost the same as above. 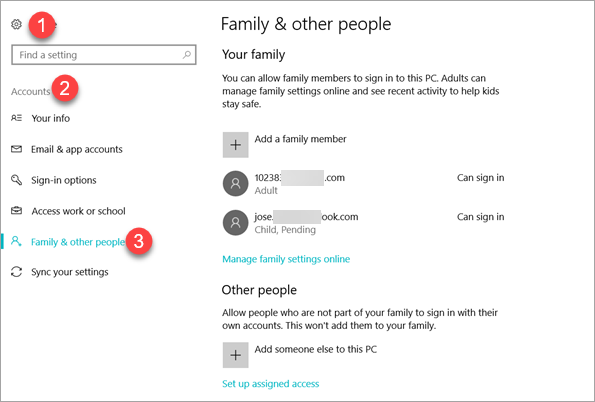 Once the added Adult or Child user accepts invitation, you can go to https://account.microsoft.com/family, sign in with your Microsoft account, and manage your “Family”. If you want to add Other people to Windows 10, just click Add someone else to this PC, then follow the setup wizard. A hidden feature is that you can add local account to Windows 10, which means that the user doesn’t need a Microsoft account to log in. Step 2. Click Add someone else to this PC. Step 3. Click I don’t have this person’s sign-in information. Step 4. Click Add a user without a Microsoft account. Step 5. Enter username and password, then click Next to create a local account. You can only input a username and leave password boxes blank if Sign in is not necessary. You can remove a local account along with all the related data. Make sure to make backup if there have important files. Check the best data recovery software in case you need. No matter you add new user to Windows 10 as Family member or other people, you can change the account type anytime. Step 2. Click an account > Change account type. Step 3. Choose Administrator or Standard account, then click OK.
Now you should know which user accounts to choose for different people and how to add new users to Windows 10. The multiple user accounts feature is quite useful for both home and work fields, but it is vital to create the right account type for different person.